I’ve recently been doing a huge amount of work with different clients and their music library. It’s all well and good rotating songs you think are good, but there’s nothing worse than finding out the competition still sounds better. There’s a real shortage of good tools here in the UK, and that’s partly down to the fact all the tech seems to be in the US. There are lots of services in America that really dig deep into the nitty-gritty numbers of a radio station, and so far I’ve never found anything that matches here in the UK. For the past couple of weeks, I’ve been using a recently discovered service called AirplayAnalyzer, and I’ve become addicted to numbers. In this article, I’m going to be taking you through some of the features of the platform, and show you the raw power of it all. I should also mention, I’m not being paid to write this, I am genuinely in love with this site, and the potential it has to music programmers around the world. When you first sign up you’re prompted to pick which station you own. This is your benchmark to use for comparisons. If you can’t find your station you can have it added to the site. Once you’ve sorted that you can then pick your main competitor, plus create a market. Using a demo account, I took ownership of Capital and set the competitor to Kiss FM UK. You can then create a market, which I did by creating a national brand in the UK market which included the aforementioned, with added BBC Radio 1, Heart, and Magic. The first tab you’ll get will be your Overview dashboard. This shows you an ‘at a glance’ view of how you square up to your competitor. These statistics include the percentage of songs you have in common, the number of songs you either have that are unique plus lots more. If you work in a hit music format, this is a fantastic feature for you. AirplayAnalyzer is always compiling what your competition is playing. This means when they play a new song you can get an email alerting you to this. You can also view all the new songs they’ve played within a date range set by you or a quick range such as ‘last week’ or even ‘last 24 hours’. You’re also able to set exactly what classifies as a new song, by the number of spins each track has had. I found this feature personally quite useful, as I was able to see exactly when Capital, Kiss and Radio 1 played a song they’ve never played on-air before. All the results can be downloaded as an Excel sheet and then passed over to your music team before their playlist meeting. Not only can they go into the meeting armed with all the new songs, they can go in knowing exactly which ones the competition have already picked up on. Much like more basic music analysis sites, AirplayAnalyzer lets you view the top 50 songs from any station, and exactly how many spins each track has had through each daypart. If you’re wondering how many times Radio X played the new Bastille track in the last week, I can tell you it’s had 31 spins, with most of them coming from the evening show and between 18:00 and 6:00. This is a useful tool, as it gives you enough figures to start working out exactly how into a new song the competition is. You will always see a clear pattern with spin numbers, and these patterns often define how high a rotation a song is in and which category. As you can see, the first 5 tracks have had 40+ spins in a week, and the last 4 have had under 30. Clearly, they’re in a lower rotation and are either going to start being played less or don’t quite have the momentum to be played lots yet. You can use this data to decide you would rather champion one of those tracks to set your output apart from the competition. One of the neat features is the ability to compare two stations on their own. Below is my comparison of Capital and Kiss, complete with screenshots. Above you can see exactly who plays music more, and who chats more across a rolling week. Already I can see that Capital is consistent with the amount of music they’re playing, whereas Kiss trail off quite a lot across the weekend. I personally can’t think why this could be, maybe it’s down to DJs in the mix, and actually, they’re playing so many an hour AirplayAnalyzer doesn’t have time to log them. Either way, in my imaginary boardroom at Capital I can at least see that we’re consistent with our level of music and speech. Below those two graphs I’ve also got the number of songs Capital and Kiss have in common, and how many are unique to each station across the past week. It’s nothing that surprises me. They share a lot of songs, but Kiss will play a couple more urban tracks whereas Capital like to play some more pop-oriented tracks that Kiss won’t touch. AirplayAnalyzer also gives me a list of exactly which songs are unique to Capital and Kiss, and which they share. Using this feature you’re able to get hold of the music logs for any station in your market, for whatever date, and between whatever time. For example, below is a music log from KIIS 102.7 (LA). These were all the songs they played on the 10th May 2018 during their breakfast show from 6am to 10am. If you want to know which stations are playing what songs, and when, you can use the song details feature. This will allow you to see when each station first played a song, how many plays it got in your market across those weeks, and who’s playing it the most. 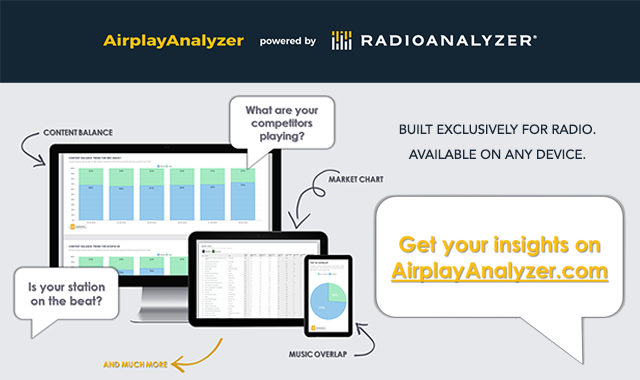 Overall I genuinely believe that AirplayAnalyzer is a game changer in the industry. I’ve learned more from a couple of hours playing around through the site than I could have done listening to each competitor and jotting down songs and times by hand. Fancy giving it a spin? They’ve got a demo account you’re welcome to use. The username is ‘airplay2018’ and the password is ‘smartradio’. Get logged in, give it a try, and make sure to give me your thoughts and opinions of the site.